PVA wishes a huge thank you to the Duluthian Magazine article featuring our creative services. Special thanks to Steve Isola and Andrea Busche at Admax for the great photos and very kind write up! Briana von Elbe-Manning, the founder and owner of Pearson & von Elbe Advertising (PVA), didn’t always intend to work in advertising. In fact, when she was 13, she decided she wanted to be the athletic trainer for the Green Bay Packers. By 1994, von Elbe-Manning was working three jobs, attending college, and maintaining a busy social life. She had even started the process of doing an internship with the Green Bay Packers. Her plans changed, however, after she was in a horrific one-car accident. von Elbe-Manning broke the C6 and C7 vertebrae in her neck, and her spinal cord was only one-eighth an inc away from being severed. She had to learn to use the left side of her body all over again. She tried to return to athletic training, but discovered she simply had too much empathy for people with injuries similar to hers. So she decided she wanted to do something that would make a difference in the lives of others without having to experience painful situations right alongside them. “I became a communications major,” said von Elbe-Manning. “I took radio classes, public relations classes, journalism classes, and media law classes. Ultimately, I fell in love with media and communications.” The education she chose would prove to be the perfect preparation for her future business. von Elbe-Manning launched PVA under its original name, Briana Pearson Advertising, just over 20 years ago on October 23, 1998. Pearson was her maiden name. She opened her first office in the Woodridge Building in Hermantown, Minnesota. Later, as her client roster grew, her need for more space grew as well. She relocated into offices in downtown Duluth and eventually purchased her current facility at 1427 London Road. On January 2, 2009, von Elbe-Manning opened her second business, Footprint Promotional Advertising, which focuses on creating customized promotional products for businesses. Footprint employs three people and offers an astounding selection of products that includes apparel and everything from penlights, cinch drawstring first aid kits, security webcam covers to LED slap bracelets, care escape tools and banners for trade shows. Today, PVA also employs three people, including von Elbe-Manning. Lindsy Wayt is the digital marketing manager whose responsibilities include social media management and website design. Wayt is also a talented photographer and takes the photos for PVA clients’ digital needs. Melissa Saice, the company’s graphic designer, focuses on creative design for logos, advertisements, posters, billboards, store signage, business cards, social media, and websites. With years of experience in the design field, Saice thrives on creating beautiful products for PVA’s clients. In her role as account manager, von Elbe-Manning meets with clients to discuss marketing objectives, maintains annual budgets, writes content for radio and TV and oversees all the careful planning necessary to successfully execute marketing strategies for clients. von Elbe-Manning also does all the media buying for PVA clients. PVA orders the best mix of television programming to fit the targeted audience. It also writes and produces the commercials by partnering either with independent videographers or local TV station production departments. PVA secures airtime on radio stations that will best reach the client’s target audience. The staff also writes and produces the radio spots, either at the radio station or in PVA’s home studio. PVA chooses the right media for clients and also designs and places the ads. PVA can help a brand new business build a website from scratch, or give an existing site a facelift. The staff also helps clients ensure their websites are secure and optimized for search engines, social media, and other digital outlets. PVA provides website optimization, search engine optimization, Google Analytics and Ads, marketing calendars, email campaigns, and in-depth reporting. PVA can increase a business’s exposure to reach potential customers, gather leads, run ads at a low marketing cost, create content, reach a targeted audience, utilize analytics (like Facebook Insights), build brand loyalty, increase website traffic, enhance search engine optimization, optimize for mobile searches, and help with reputation management. It can also optimize clients’ social media marketing calendars and budgets. PVA uses all of the strategies above to create a plan designed for performance and results. Each campaign is specifically designed to meet clients’ individual business needs. Outside of the marketing realm, von Elbe-Manning also likes to help other entrepreneurs. She assists businesses in developing business plans, determining budgets, and developing employee systems. PVA has a very diverse clientele that includes retail, industrial, medical, hospitality, nonprofit, and food service businesses. And its clients are also observing milestones: two of them recently celebrated 20 years with PVA, one client celebrated 19 years, and one celebrated 17 years. On average, the company’s core client base has been with PVA for 10 to 20 years. 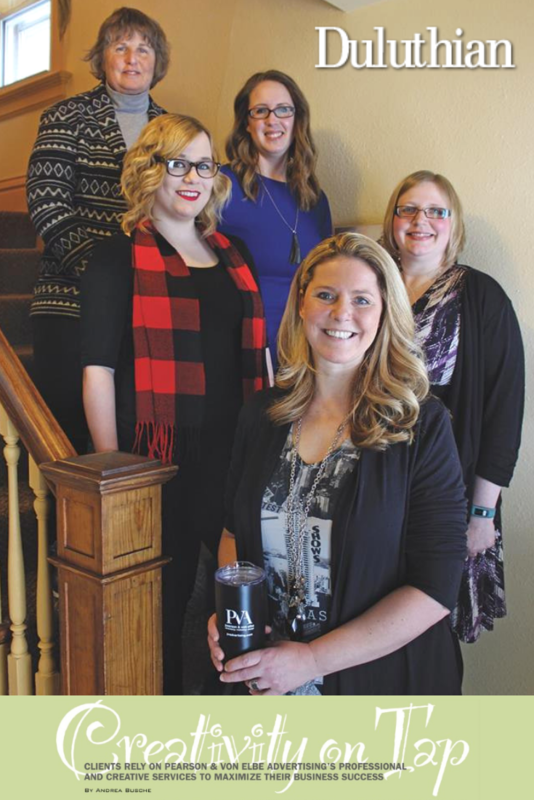 von Elbe-Manning was honored by the Duluth News Tribune in 2012 as a winner in its annual 20 under 40 Awards. She was also nominated three times for the Joel Labovits Entrepreneurial Success Awards that were sponsored by the University of Minnesota Duluth’s Center for Economic Development. The first time was for “Emerging Entrepreneur,” the second was for “Established Entrepreneur” and the third was for the “Mature Entrepreneur” business category. She has also been honored for her work on community service projects over the past 20 years. And PVA created a logo for a client that received a national award as well. Thanks for reading! To learn more about PVA, feel free to contact us!